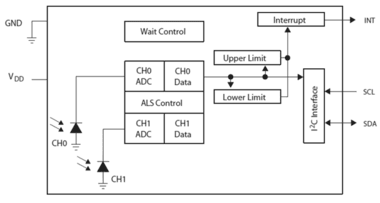 TSL2572 device family provides ambient light sensing (ALS) that approximates human eye response to light intensity under a variety of lighting conditions and through a variety of attenuation materials. Accurate ALS measurements are the result of TAOS' patented dual-diode technology and the UV rejection filter incorporated in the package. The operating range can be extended to 60,000 LUX when the low-gain mode is use. The TSL2572 device is particularly useful for enabling Automatic Brightness Control (ABC) in large LCD Flat Panel TVs and displays by providing optimum viewing in diverse lighting conditions (daytime versus nighttime viewing) while significantly reducing energy consumption to meet the stringient EneryStar requirements.